Earlier this month renders of an upcoming LG device dubbed ‘Alpha’ leaked out online. Initially, the device was believed to be the company’s next flagship but LG quickly shot down those rumors. 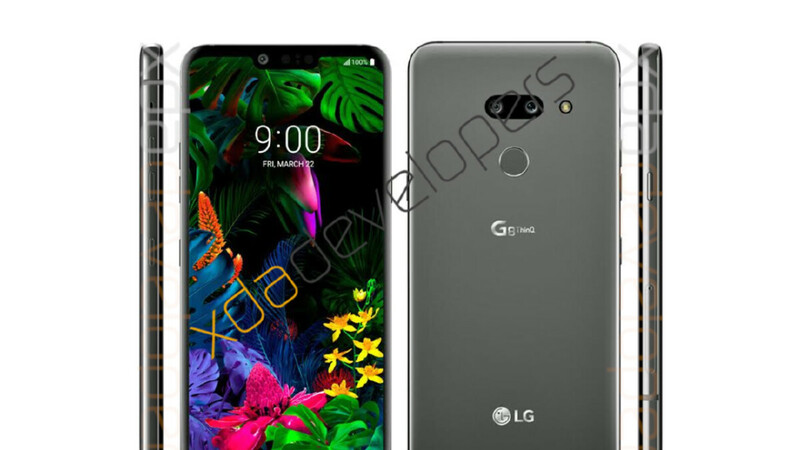 Today, however, the folks over at XDA Developers claim to have obtained renders of the real LG G8 ThinQ and, surprisingly enough, it looks pretty similar to the previous device. Because of this, we contacted LG to which they replied saying that they "have nothing official to add to the speculation. All will be revealed in less than a month." Taking a look at the smartphone's design, the alleged renders showcase a horizontally-aligned dual-camera setup on the rear. This replaces the vertical one found on last year's LG G7 ThinQ and is essentially identical to the one found on the previously-leaked 'Alpha' prototype. In fact, the only noticeable difference is the fact that this camera module sits flush against the glass panel whereas the previous renders showcased a slight lip. 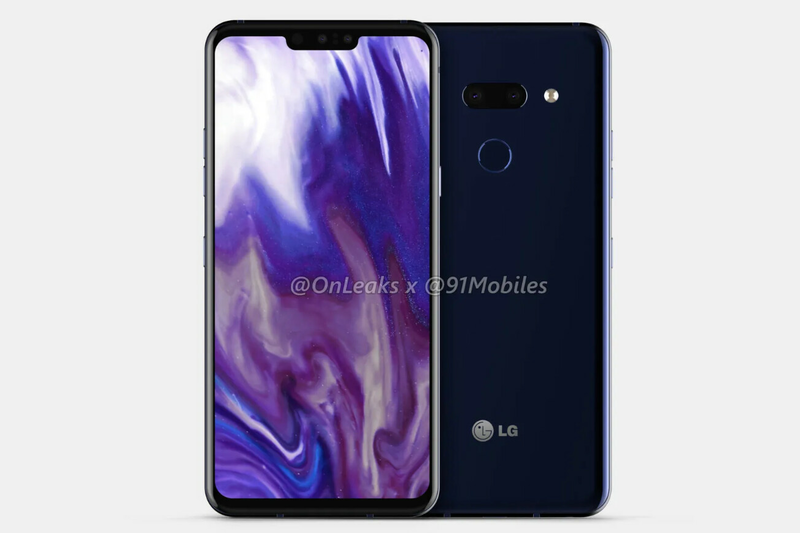 As per usual, the rear panel is also adorned by an 'LG' logo towards the bottom, the 'G8 ThinQ' branding in the middle, and a single-LED flash. The smartphone also sports a rear-facing fingerprint scanner. This would suggest that, if the renders are accurate, LG is once again skipping the in-display fingerprint scanner trend, unlike the Galaxy S10 series, Huawei's Mate 20 Pro, or even the OnePlus 6T. Moving over to the front of the supposed flagship, the LG G8 ThinQ renders show a device which, when compared to the leaked prototype, sports slightly more rounded corners. As a result of this, the device is now closer in looks to last years' LG V40 ThinQ than the LG G7 ThinQ that it succeeds. Nevertheless, the relatively thick chin and large notch are retained. While on the topic of the notch, it's worth noting that this is home to just one front-facing camera and four sensors. The exact functionality of these remains a mystery at the moment, but it's possible that LG has included an alternative to Apple's Face ID and Huawei's Face Unlock. After all, the requirements for such a setup would be an IR camera, a Time-of-Flight one – these could be the bigger sensor – and a dot project which could correspond with one of the smaller sensors. The remaining one could be the proximity sensor. The smartphone's notch is also missing one important feature, the in-ear speaker. According to previous reports, this is because LG has included a new sound-on-display technology that utilizes bone conduction. Considering the LG G8 ThinQ's expected flagship status, it's only natural that Qualcomm's Snapdragon 855 be expected on the inside. According to the folks over at 91Mobiles, though, the next-gen flagship may actually arrive powered by last year's Snapdragon 845. This chip can currently be found inside the LG G7 ThinQ and the LG V40 ThinQ and, if accurate, would be the second time LG has used an older processor inside a flagship – the LG G6 used the Snapdragon 821 rather than the Snapdragon 835. Regardless of this, the upcoming smartphone should also arrive with at least 6GB of RAM and 128GB of internal storage. Likewise, Android 9 Pie complete with LG's usual custom overlay is to be expected along with a 3.5mm headphone jack and a 6.1-inch OLED display. But one thing that is yet to leak is the battery capacity. If rumors are anything to go by, the LG G8 ThinQ will go official at MWC 2019 later next month. Here, it'll be accompanied by the company's first 5G flagship which, as recently revealed, will sport a number of flagship features. These include the Snapdragon 855, a large 4,000mAh battery, and a dedicated vapor chamber to make sure there are no overheating issues. In regards to a release date, LG's mainstream flagship is expected to hit shelves sometime in March in order to better compete with Samsung's Galaxy S10 series. The yet-to-be-named 5G smartphone, on the other hand, will likely see a release during the second quarter of the year, perhaps as late as June. When this happens, it'll be available exclusively on Sprint in the US and through a variety of other networks across Europe. A rear fingerprint sensor...in 2019. LG needs to get HTC'ed already. poor LG... why dont they just listen to the people? rather have that kind of g8 than any other phone with in-display fingerprint. but yeah, it looks like htc u12+ with a notch and a clicky volume buttons! LG got infected with HTC and Sony disease. Farwell, dear LG, for the old times. Looks good to me! The top bezel and chin are the same size so it looks nice, the notch also flows into the top bezel which looks nice. I would've liked an in screen fps though. "in all its glory"?? You mean in all its misery? This looks like 2017, not 2019. Didn't buy into the notch in 2018. This is a joke surely. Ugh! So boring... LG should stick to TV’s and other appliances. I'm calling fraudulent. Looks just like the G7. If nothing else LG differentiates the physical design of each incarnation of their devices. If this is indeed the G8, It's incredibly lazy design. I can only hope the features are enough to make anyone interested look past the bland design. Why couldn't they have slimmed down the bezels a bit more? OMG. iPhone like notch and rear fingerprint scanner... With devices like that LG would better quit smartphone business. If shown on picture is G8 when in my opinion it looks like mid-range 350 USD phone from China. In fact some Chieneese manufacturers offer much more appealing design than this so called flagship from LG. LG está perdendo muito dinheiro no setor móvel, você também tem que entender que eles não pode inovar a cada ano! How do I go from looking at the vivo apex 2019 flagship to this turd. I have owned every LG phone and I just can't anymore. LG would like to play safe this year. How are you going to have a top bezel and a notch!? This is blasphemy. LG can't afford to be boring and re use last years design. No to notches and holes! Yo! Sounds like explicit lyrics. Doesn't it? Lol.